Kate Toon is an award winning copywriter and she recently founded The Clever Copywriting School. Kate is one of Australia’s thought leaders in SEO copywriting and SEO consulting. Having worked with the likes of the RTA, Virgin Mobile, Symantec, American Express and Westpac Kate has built a killer process and earned considerable experience in all areas to do with writing persuasive and effective SEO copy that search engines love. Kate Toon is the preferred partner for copy for the Online Marketing Gurus and comes highly recommended (you should check out Kate’s SEO events in Melbourne and Sydney here). When did Kate Toon start a Podcast? 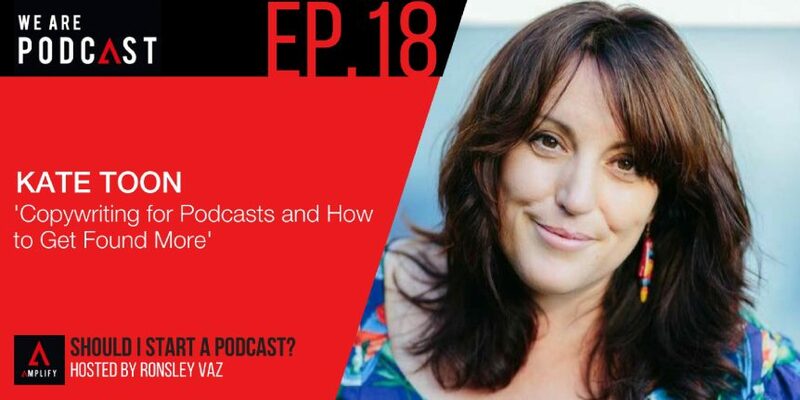 How was Kate intimidated by thousands of copywriters when she just started her business and how she was able to get back on track and get going? Why is Podcasting hot all of a sudden? What’s the advantage of podcasting with multiple hosts? How complicated it is to do a podcast? It’s a super intimate relationship if you think about podcasting because people are listening to you on walks or if they are doing something else. And your voice is going directly into their ears, and they are focusing just on you for 20-30 minutes. When do we ever listen to any of our friends like that or even our loved ones? It is quite a relationship that you form with someone. If you can brave enough to get it going, you could find somebody who would just fall in love with you. It was very easy because I let Belinda doing all the technical stuff. I’m good at building websites and doing graphics. So I build websites, the graphics, the branding. I bought a mic and then I got the ScreenFlow software. I organize Libsyn to do our hosting, and I use Powerpress to get our podcasts into our blogs. We were finding good resources on how to do things, but that was before the We are Podcast conference. Belinda does the iTunes links, and now we outsource the editing. I think underestimating the amount of time that it is involved was my biggest mistake. You’ve got to think of the idea; you have got to make notes for each episode. If you do interviews, you’ve got to arrange the interview. You’ve got to write the questions. You’ve got to record the thing. It doesn’t always runs smoothly, and you make mistakes. Choosing a co-host that you get along with. Where you both complement each other. One thing a podcast is helped me do is to build trust with my community. As you said, you can’t hide anything on a podcast because you are talking for a while. We’re not scripting this; it’s just us talking. So people are going to get to know me, and it does builds trust. When I then say “Hey I’m selling this course, or I’m offering this service”, people already trust me. People get my sense of humour. I can make a joke for social media, and people will understand me. I know that they get the reference. You feel like you are part of the secret community. So if you can feel connected to someone, even if it’s on a podcast, that’s a great feeling. And as long as you follow it through everything you do. The idea is you should try and be yourself wherever you are, whatever medium you are on. For people starting out, a podcast will allow you to raise your profile. I think your profile is critical. And I also believe you have to do it because you really enjoy it. You have to enjoy podcasting. I listen to Ricky Gervais. I love Robert Gerrish. Some of them I just listen to for the Voice. I’ve listened to a few Pat Flynn. I think he’s good and fun.